Posted by Bev Bunker in Uncategorized. 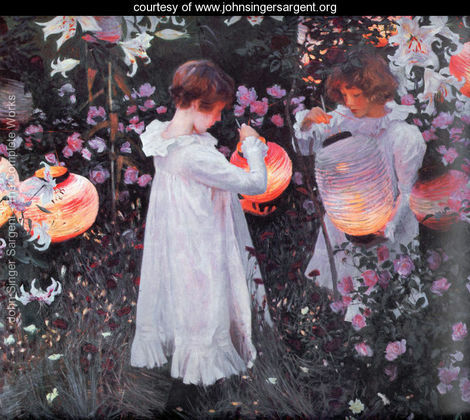 One of my favorite artists is John Singer Sargent. He was born in 1856 and died in 1925. He was a very talented and prolific artist having done over 900 oils and more than 2,000 watercolors along with countless charcoal sketches and endless graphite drawings, all between 1877 and 1925. He painted 2 United States Presidents, aristocracy of Europe, and barons of business – Rockefeller, Sears, Vanderbilt, along with gypsies, children, and tramps, all with the same passion. Click on ‘Major Paintings’ – here is where you will get a quick look at some of Sargent’s major pieces which link to essays explaining why he did that painting. Click on ‘Chronology Thumbnails‘ – here is the main body of this site gallery. It starts the year he was born (1856) and runs until his death (1925). It concisely outlines his life story and show the paintings he did each year. If that doesn’t give you enough of him, here’s another link, The John Singer Sargent Method of Painting – YouTube – www.youtube.com/watch?v=JyVCfMdKxWs – Paul DuSold, a Philadelphia artist, explains the John Singer Sargent method.